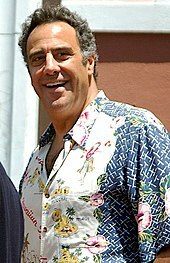 Brad H. Gerstenfeld (born April 14, 1960), known professionally as Brad Garrett, is an American stand-up comedian, actor, voice actor and professional poker player. He has appeared in numerous television and film roles. Garrett was initially successful as a stand-up comedian in the early 1980s. Taking advantage of that success in the late 1980s, Garrett began appearing in television and film, in minor and guest roles. His first major role was Robert Barone on the CBS sitcom Everybody Loves Raymond. The series debuted September 13, 1996 and ran for nine seasons. Garrett's film roles include Pocahontas II: Journey to a New World (1998), A Bug's Life (1998), An Extremely Goofy Movie (2000), Stuart Little 2 (2002), Finding Nemo (2003), Garfield (2004), The Pacifier (2005), Night at the Museum (2006), Ratatouille (2007), Night at the Museum: Battle of the Smithsonian (2009), Tangled (2010), Hoodwinked Too! Hood vs. Evil (2011), Planes (2013), Teenage Mutant Ninja Turtles: Out of the Shadows (2016) and Christopher Robin (2018). Garrett also played the leading role of Eddie Stark on the Fox sitcom 'Til Death from 2006 to 2010. Garrett has won three Primetime Emmy Awards, with three other nominations. He is still prominent within stand-up comedy and is also a professional poker player. Garrett is noted for his imposing height of 6' 8.5" (2.04 m), and his distinctive deep voice. Garrett was born in Woodland Hills, California to Barbara (née Colton), a homemaker, and Alvin "Al" Gerstenfeld, a hearing aid salesman. He is Jewish, and celebrates both Christmas and Hanukkah. Garrett has two older brothers, Jeff and Paul. He attended George Ellery Hale Middle School and graduated from El Camino Real High School, both in Woodland Hills. Garrett attended UCLA for less than two months before dropping out to pursue his comedy career. After achieving a strong measure of success with stand-up comedy, Garrett decided to change gears and try his luck with performing on TV. From 1985–1986, he was the voice of Hulk Hogan (in a voice similar to Rodney Dangerfield) for the cartoon series Hulk Hogan's Rock 'n Wrestling, He was featured on Family Feud during Ray Combs's tenure in a "Funny Men vs. Funny Women Week" during November sweeps. He also appeared for a week on the game show Super Password in 1987. He also appeared on Hollywood Squares including a memorable moment when he impersonated Bill Cosby during a question about Jell-o. He then appeared in the short-lived summer comedy First Impressions (CBS, 1988), in which he was a divorced father who makes a living doing impressions, in a one-time spot as a bank loan officer on Roseanne (ABC), and The Pursuit of Happiness (NBC, 1995–96), in which he was the hero's gay best friend. Though prior to these roles, Garrett had also had a minor part on Transformers, voicing the Decepticon base Trypticon in season three and as an ill-fated thug in Suicide Kings. He soon won the role of Ray Romano's brother Robert Barone on the long-running family-oriented comedy hit Everybody Loves Raymond. Garrett has also made an appearance on The Fresh Prince of Bel-Air playing a hitman who attempts to kill Will Smith's character. His role on Everybody Loves Raymond won him five Emmy Award nominations, and the 2002, 2003 and 2005 Emmy Awards for Outstanding Supporting Actor in a Comedy Series. In 1990, Garrett appeared as a semi-regular panelist on the revival of Match Game. On the May 2, 1996 episode of the sitcom Seinfeld, called "The Bottle Deposit", Garrett played a deranged auto mechanic who steals Jerry Seinfeld's car. In 2003, he was also nominated for the Emmy Award for Outstanding Lead Actor in a Miniseries or Movie for Gleason. With his Raymond castmates, he won the 2003 Screen Actors Guild Award for Outstanding Performance by an Ensemble in a Comedy Series. He won the fifth season championship of Celebrity Poker Showdown, and played in the 2005, 2006 and 2007 World Series of Poker. Garrett was hoping to do a spin-off with his character Robert Barone from Everybody Loves Raymond when the show ended its nine-year run in 2005, but he withdrew in October 2005 due to inaction from CBS that led to a number of the writers from Raymond leaving and taking other jobs. In 2005, Garrett appeared on Broadway playing Murray the Cop in the revival of Neil Simon's The Odd Couple with Nathan Lane and Matthew Broderick. He understudied Lane in the role of Oscar Madison, and substituted for him in January 2006, during Mr. Lane's illness. That same year, he starred in The Pacifier opposite Vin Diesel. In 2006, Fox network announced they would pick up a new sitcom called 'Til Death starring Garrett in the lead role. The plot revolves around a long married couple whose new next door neighbors are a pair of feisty newlyweds. Joely Fisher plays Garrett's wife in the series. He also appeared onstage on American Idol season six (2007) during judging on week 11, to which Ryan Seacrest said, "And the next person off American Idol is—Brad, you're out." In the fall of 2008, Garrett starred in, and was the executive producer for, an online reality show called Dating Brad Garrett. In 2008, Garrett hosted a celebrity roast of Cheech & Chong, which was aired on TBS. In 2009, Garrett entered the main event at the World Series of Poker, losing on the second day of the event. Garrett has starred in commercials for 7-Up, where he portrays a more happy, cheerful version of himself because of the soda. In June 2010, he opened Brad Garrett's Comedy Club in the Tropicana Resort and Casino in Las Vegas, Nevada. In December 2010, he was one of the narrators during performances of the Candlelight Processional at Epcot. In June 2011, I Kid with Brad Garrett, a candid kids show, premiered on TLC. On December 12, 2011, Garrett closed his club at the Tropicana. He started a new club with the same name across the street at the MGM Grand, and is active as of April 2016. In the summer of 2013, Garrett played Chug in the movie Planes. Planes marked the 4th time he starred in a movie with John Ratzenberger. In the fall of 2013, Garrett played a recurring character in The Crazy Ones. On May 19, 2016, he was confirmed to appear as the voice of Krang, in the sci-fi action comedy film Teenage Mutant Ninja Turtles: Out of the Shadows. In November 2016, Garrett portrayed Frankenstein's monster in a Christmas commercial for Apple's iPhone 7. As of 2017, the ad has received over seven million views. In 2018, Garrett voiced the character Eeyore in the live-action film Christopher Robin, based on Disney's Winnie the Pooh franchise, and in a cameo in the animated film Ralph Breaks the Internet. He previously voiced the character in the 1995 video game Disney's Animated Storybook: Winnie the Pooh and the Honey Tree. In 1998, Garrett proposed to his then-girlfriend, Jill Diven, on the set of Everybody Loves Raymond, and they were married on May 18, 1999; together they have two children, Maxwell and Hope. Garrett and Diven separated in 2005, and Diven filed for divorce in July 2006. The divorce was finalized in November 2007. As of December 2015, Garrett is engaged to long-time girlfriend, IsaBeall Quella. In 2007, Garrett struck a TMZ photographer's camera, which the photographer claimed hit him in the face. The Los Angeles District Attorney declined to file assault charges against Garrett, because the DA felt Garrett was provoked in the incident. Garrett was the grand marshal for the Auto Club 500 on February 24, 2008. In 2009, he appeared on Are You Smarter Than a 5th Grader? and played for his charity, the Maximum Hope Foundation (named after his children). He answered every question correctly, winning $25,000. 1987 The Real Ghostbusters Arzuun / Tolay Episode: "Egon's Ghost"
1991 Roseanne Doug Episode: "The Pied Piper of Lanford"
1994 The Fresh Prince of Bel-Air John "Fingers" O'Neill Episode: "Fresh Prince: The Movie"
1995 The Twisted Tales of Felix the Cat Fufu Gauche Episode: "The Earth Heist/Attack of the Tacky"
1996 Lois & Clark: The New Adventures of Superman Reverend Bob Episode: "I Now Pronounce You..."
1996 Mad About You The Nurse Episode: "The Sample"
1996 Seinfeld Tony Episode: "The Bottle Deposit"
1996 The Tick Jim Rage Episode: "Tat Mustache Feeling"
1998 Murphy Brown SWAT Team Captain Episode: "Wee Small Hours"
1998 The King of Queens Robert Barone Episode: "Road Rayge"
2008 Monk 'Honest' Jake Phillips Episode: "Mr. Monk Buys a House"
2010 Glory Days Jerry Harrington Episodes: "Pilot", "Papa Don't Pre-Game"
2015 Manhattan Eli Isaacs Episode: "Human Error"
2016 Law & Order: Special Victims Unit Gary Munson Episodes: "Interesting Lives", "Heartfelt Passages"
2016 This Is Us Wes Manning Episode: "The Big Three"
2017 Bull Ron Getman Episode: "The Illusion of Control"
1990 The Adventures of Don Coyote and Sancho Panda Rosinante Episode: "Pity the Poor Pirate"
1992 Goof Troop Big Boy Bandit Episode: "To Catch a Goof"
1993 The Legend of Prince Valiant King Aaron Goth Episode: "The Eyes of the Serpent"
1993 Mighty Max Spike Episode: "Norman's Conquest"
1993 Wild West C.O.W.-Boys of Moo Mesa Unknown character Episode: "Circus Daze"
1994 Batman: The Animated Series Goliath Episode: "Sideshow"
1994 Bobby's World Anthony and Anthony's Dad Episode: "Rebel Without a Clue"
1995 What a Cartoon! Harley Episode: "Hard Luck Duck"
1995 Fantastic Four Hydro-Man Episode: "Inhumans Saga: Part 1: And the Wind Cries Medusa"
1996 Tales from the Crypt Drinky and Zombie Pig Episode: "The Third Pig"
1996 The Tick What Interrogator Episode: "The Tick vs. the Big Nothing"
1996 Earthworm Joe The Lord of Nightmares Episode: "Evil in Love"
1996 Quack Pack Beef Jerky Episode: "Ducks by Nature"
1997 101 Dalmatians: The Series Buttons Episode: "Shake, Rattle and Woof/Cadpig Behind Bars"
1998 Voltron: The Third Dimension Bull Max 7 Episode: "A Rift in the Force"
2002 Kim Possible Big Mike Episode: "Tick-Tick-Tick"
2002 Ozzy & Drix Strepfinger Episodes: "Strep-Finger", "Ozzy Jr."
2003 Justice League Lobo Episodes: "Hereafter", "Hereafter: Part II"
2010 Special Agent Oso Professor Buffo Episodes "From China with Love/Thunderbasket", "Dr. Juice/For Your Nose Only"
2018 Tangled: The Series Fish Monger Episode: "Vigor the Visionary"
^ "Brad Garrett Biography (1960–)". Filmreference.com. Retrieved July 23, 2016. ^ "It's good times for Brad Garrett as his Comedy Club turns 2 at MGM Grand – Las Vegas Sun News". Lasvegassun.com. Retrieved July 23, 2016. ^ "Brad Garrett's Comedy Club – MGM Grand Las Vegas". Mgmgrand.com. January 1, 1970. Retrieved July 23, 2016. ^ "Deja Scene Connections". Dejascene.com. Retrieved July 23, 2016. ^ Nudd, Tim (November 21, 2016). "Apple Enlists Frankenstein in This Strange, Sweet Appeal for Acceptance This Holiday: Not just about friends and family". Ad Week. Retrieved December 17, 2016. ^ "Apple — Frankie's Holiday". YouTube. Apple. November 21, 2016. Retrieved December 17, 2016. ^ Sneider, Jeff (August 14, 2017). "Brad Garrett to Voice Eeyore in Disney's "Christopher Robin" Movie Starring Ewan McGregor". The Tracking Board. Retrieved August 21, 2018. ^ "Ralph Breaks the Internet – Press Kit" (PDF). wdsmediafile.com. Walt Disney Studios. Retrieved November 18, 2018. ^ "Christopher Robin: The Differences Between Live-Action & Disney's Animated Version". ScreenRant. August 3, 2018. ^ "Patton Oswalt Interview on Ratatouille Animated Movie". Movies.about.com. Retrieved July 23, 2016. ^ a b "Brad Garrett Finalizes Divorce; Major Split Of Assets". Access Online. ^ Silverman, Stephen M. (August 15, 2006). "Raymond's Brad Garrett, Wife Secretly Split – Divorced, Brad Garrett". People.com. Retrieved July 23, 2016. ^ "Brad Garrett's Divorce Is Finalized". ^ "Brad Garrett Finalizes Divorce; Major Split Of Assets". Access Online. ^ "Brad Garrett Engaged to Girlfriend IsaBeall Quella". etonline.com. November 1, 2016. Retrieved April 12, 2017. ^ "Brad Garrett Is Engaged to Girlfriend Isabella Quella". People.com. November 1, 2016. Retrieved April 12, 2017. ^ "Brad Garrett seen striking man's camera". Usatoday.Com. August 14, 2007. Retrieved July 23, 2016. ^ "Brad Garrett Seen Striking Man's Camera". Washingtonpost.com. August 14, 2007. Retrieved July 23, 2016. ^ "D.A. Won't Charge Garrett Over Pap Smack". TMZ.com. December 19, 2008. Retrieved July 23, 2016. ^ Odman, Sydney (August 2, 2018). "'Christopher Robin': Meet the Voices Behind the Animated Characters". The Hollywood Reporter. Archived from the original on August 2, 2018. Retrieved November 8, 2018. ^ "Ralph Breaks The Internet - Press Kit" (PDF). Walt Disney Media File Website (Press release). Disney. Archived from the original (PDF) on November 5, 2018. Retrieved November 5, 2018. Wikimedia Commons has media related to Brad Garrett.